It's been a wild week. Thunderstorms on Tuesday night knocked out the power through much of the Park. Dave and Andrea drove back to Canyon from Mammoth after the storm and saw many trees across the road. Canyon was without power for 11 hours and we spent much of Wednesday morning working without electricity. I got up at 4:00am to check on the cooler temps and decided to head back to bed when I saw that we were going to lose two coolers full of food. Wednesday was a morning full of cold showers and puffy hair that didn't get the benefit of a hair dryer or curling iron. We were not as bad off as Lake was. Power lines went down in the government housing section and they were without electricity for 22 hours. The power outage came just in time for our Director of Operations, the head of HR, our Controller and the Regional Manager came to spend the day working different jobs (cooking, janitorial, stocking) at the Canyon General Store. They got to live firsthand how the stores are worked without power. When the power came on I headed over with camera in hand to snap a few photos of my bosses cooking and hauling out bags of garbage. Though the Adventure Store was not involved with having them work all of us YGS employees had fun working with them and watching them do our jobs. Last night the head of concessions for YNP had a retirement party and I headed to that with Patrick. I got to know Judy when I was working at Mammoth this past winter. It was also her and her husbands house that I got to go to for Thanksgiving last year. Another thunderstorm came through the area but not with the same results as Tuesdays. This morning I had to drive through another storm that dumped hail on my car and when I worried that my windshield would bust out I found a tree to park under. More storms may come tonight. I needed to drive down to Grant Village this afternoon. At Alum Creek there is an elk kill with a grizzly feeding on it. A HUGE crowd of people were out in the valley watching the bear. The roads, shoulders and pullouts are filled with cars and people. The bear has been there all day. Since I was on work related duty (and not really in the mood to battle for a parking spot) I didn't stop but I did get to see the bear, which is rather large, off in the distance with it's prize. I saw grizzly by Mud Volcano last week and two different black bears, one by Tower Junction and one north of Dunraven Pass. But mostly I've been doing chipmunk watching in front the off the store. The weather has warmed up and for the first time I can look at the weeks forecast and not see the words 'snow flurries' in it. I should have about 2 months of respite from those flakes. Who do I call when something needs repair? That would be our miracle worker Mark. Mark is a former machinist or 'turbine jockey' which is someone who worked on wind turbines. This is his first time working in Yellowstone and is not even close to becoming accustomed to the 'winter in June' temps. He came to Yellowstone with his wife and son, who work in Canyon General, and his daughter who works at Fishing Bridge. Though I have to share his mechanical expertise with Canyon General I can always count on him to give a hand. And because of Mark I now how to correctly store an extension cord without it getting tangled. Thanks Mark for all the help! Say Hello to Cassie! Cassie has a degree in Human Services and will be attending Grad School in Denver for Organizational Development in Training after her stint in Yellowstone is over. This is not her first job in a national park, she also worked in Acadia. She has also been a cheerleading coach and a Jenny Craig Consultant in New York City. At the Adventure Store she is our 'Huckleberry Lady' because of her devotion to the huckleberry display. With her keen eye she can whip together a beautiful gift display, greet guests and ring up sales in one breath. She does an awesome job and we are lucky to have her! Thanks Cassie! Jay is one of three Floor Supervisors at the Adventure Store. He has a degree in Psychology and has worked in seven national parks. He has also visited 15 countries and worked as an English teacher in Japan (curiously enough he says being able to speak Japanese is not a requirement for that job). So how do you top a resume such as that?! Well, you work in Yellowstone at the Adventure Store....and you do one heck of a job! And what is next for Jay? Marriage - to Cassie! Yup, Jay and Cassie are engaged to get married. Congratulations Jay and Cassie, and thanks for all the hard work! The lack of recent postings is due to the 1 1/2 week long bison jam I've been in. Ok, not really. But I have spend quite a bit of time sitting in grizzly bear jams - 2 within 5 minutes of each other, one in Hayden Valley and then another just south of Mud Volcano - as well as bison and a coyote jam. And then there is the occasional 'bear rock' jams. Bear rocks are those distant boulders that make people stop and pull out their binoculars so they can get a good look at a bear only to realize that they are looking at a rock. On my travels through the Park I have memorized each boulder that may resemble a bear from a distance, though I still am occasionally fooled by a stump. Last Thursday I took a picture of the front of the Adventure Store. What was unusual (or not so unusual this year) about the picture was that it also captured the snowflakes that were falling. We are still dealing with rain and snow though this last week has been rather pleasant. Dunraven still gets closed once in awhile, but mostly because of slick roads. If your heading to Yellowstone don't forget to pack some warm clothes. There was a grizzly bear mauling about 6 miles outside the East Entrance on Thursday that resulted in the death of a man. He was a botanist who recently published a book about plants in Yellowstone. The bear responsible was eventually tracked down and destroyed. The article about the incident is in some of the local papers. I've been extremely busy during the week but on Friday I made it to Cody to finally get Wyoming plates put on my car. During my 'down time' from the store I've been doing some fun things, such as this weekend when Patrick took me for a drive up some back roads around Jim Mountain by Wapiti. Fabulous scenery! From way up there I could look down over the Wapiti Valley and see how green it is by the river. Last night we went to a NPS Volunteer and Employee potluck and then it was off to listen to the string quartet at the Lake Hotel. The older I've gotten the more I have come to appreciate classical music and there is nothing more relaxing than sitting in the Lake Hotel and listening to the quartet play. I highly recommend this experience to everyone. Other than that I've been going to meetings for the grocery department, the apparel department and tomorrow I head to West Yellowstone for a managers meeting. I enjoy the meetings because I get to meet people from other YGS throughout the Park. I'm also being talked into playing softball next Monday for the Delaware North team vs the Xanterra team. I don't even know if I'm still capable of hitting a softball or running without a mad bison behind me. It should be interesting. On my trip to Minnesota last month I did have a funny situation. My friend's daughter, Leah, was introducing me as her "mom's friend from Yellowstone." I told her about the grizzly bears and bison and all the interesting things that I get to see and do. And what was the most fascinating thing she got out of our conversation? It was the fact that I hadn't watched tv in over a year! Heeeeere's Rosie! This is Rosie's third year working for YGS. She is one of our auditors that we share with Canyon General. Her life before Yellowstone entailed hiring and training 911 operators, working as a Realtor, and working at the Nelson Art Gallery. She is a whiz with numbers and always does a great job. Her passion is for photography and can be seen on Dunraven or in Hayden Valley working her photographic magic. I always look forward to Rosie coming into the office so we can have a quick discussion about our love for shoes and Skittles. Rosie, it's great working with you! Morgan is the newest volunteer at the Canyon Visitor Center. She stopped in during her day off from the Adventure Store to show us her new uniform. She will be working in the visitor center on Mondays and during her shift changes on Thursdays. She is so excited. Also, a big Yellowstone 'Hello' goes out to Morgan's grandmother! I've had to go to Gardiner a couple times this past week in the evenings and I've found driving through Swan Lake Flats a regular obstacle course. The pull outs are lined with photographers in chairs with their scopes and equipment. Everyone is waiting for the hopeful arrival of the mama bear with the four cubs. Ken had gone there a few times and talked with a NPS ranger who said that DNA testing was being done on the droppings to see if all four cubs were hers or if she adopted any of them. It is unusual to have so many cubs. I have yet to see her as I don't stop - as if there was a place to stop. I also heard something about someone being gored by a bison yesterday. Yikes! The herd is growing larger in Hayden Valley. Yesterday morning I had to stop as the entire herd walked down the road. I always roll down my window so I can hear the clip clop of their hooves on the pavement and to hear their puffs and grunts. There were lots of little red baby bison with little horn knobs. Finally yesterday there was some sun and warmth. The mercury rose to almost 70 degrees so I took every opportunity to step outside and enjoy it. As for the rest of the week: rain and thunderstorms are in the forecast. Ken has left us for Grant Village but our newest arrival is Matt who came in yesterday. He is going to fit in nicely with our happy group. I have assigned Dave and Morgan to represent the Adventure Store in the YGS Social Committee. I can't wait to see what fun activities they come up with for the two stores here in Canyon. So far we had an evening of ice cream and line dancing. Too much fun. Meet Lee, our vivacious Associate from California who now resides in Missoula (when not living in Yellowstone). Lee is a Certified Ophthalmic Technician who has traded careers for the fun and rewarding job as an Associate at the Adventure Store. She has wowed everyone with her outgoing personality and her determination to make every guest feel welcomed in the store. When not greeting our guests she is out hiking the trails with her bear spray (which she had her hand on when coming within 30 feet of a grizzly by the cabins earlier this spring) or just taking a leisurely drive looking for wildlife. Lee says that she "absolutely loves being in Yellowstone Park" and I say we "absolutely love having you here!" Howdy Pardner! This post comes straight to you from the Buffalo Bill Cody Museum in beautiful downtown Cody. There is an Internet terminal here, and since no one was waiting to use it I decided to make a post. The weather continues to be rainy and cold. There were actually snowflakes Friday morning at 6:00 that stayed on the ground for a while in Canyon. At about 9:00 huge flakes came down. As beautiful as it was we all had to let out a long, drawn-out sigh. Summer, summer, where are you? So on a overcast and chilly day there is nothing better to do but to check out my next museum collection here at the BBC Museum, which is the Native American section. So off I go, ready to see and learn more about the local Native American culture. Oh, next week there is a Pow Wow here in Cody, which I would like to attend. I present to you Morgan, one of our newest additions to the Adventure Store. She is an old pro at being a national park concessionaire employee as she has previously been employed at Mt. Rainier National Park and at the USS Arizona in Hawaii. She is also a CNA and has just started her volunteer park service stint at the Canyon Visitor Center. After a day of helping guests and brushing up on her fly fishing knowledge at the Adventure Store she is known to prowl the trails in the area with her new friends and co-workers. With her outgoing personality and warm wit I knew immediately that she would fit in at the store with ease. Welcome to Yellowstone, Morgan! On Saturday, as I was driving down the winding dirt road from Patrick's cabin in Wapiti I rounded a rain slicked bend in the road and found a mama moose and her new baby right in the middle of the road. It was one of the last things I expected to see and it took me a second to realize that this massive, brown, leggy creature was a moose. She was surprised to see me sliding to a stop and rocked back and forth trying to decide which side of the road she should make her quick exit to. She decided to head up slope away from the stream. While her youngun' struggled to keep his legs under him/her as he maneuvered between the rocks and brush trying to keep up with his/her mama. What a lucky day, seeing such a site and having my SD card in my camera! Maryellen and Dave stopped in the store to say 'hi' to me but I was gone. Sorry to have missed you both! And I'm sorry to have missed Dan, but thanks for stopping in. I did manage to meet my Soul Sister, Maureen. It was great to finally meet you! Also, a "Hello" goes out to Kimberly and Pat. Pat is building a website: www.secretyellowstone.com. Check it out! And a big "Hello" to Sharon and former Park employee James! Thanks for writing everyone, it's always fun to hear from people but I'm falling behind in my replies. Please be patient and I will find a moment from all my fun to get back to you! John & Jackie came to Wapiti from a brief visit Saturday afternoon after doing their weekly Cody shopping but had to spend 1 hour waiting for the East Entrance to open. There had been a bit of a rock slide by Lake Butte. The constant rain is causing a few slides, flood watches, and causing the rivers to rise and flow wildly. The North Fork of the Shoshone is a mass of brown waves with the occasional tree floating by. As it runs into the Cody Reservoir it is causing the west side to be brown from everything the water picks up along the way. Rain is in the forecast for at least another week. On Friday the ice on Yellowstone Lake finally went out. The bear jams seem to be rather numerous in the area. There was one this morning on the other side of Dunraven and on Friday by the marina. There is a dead bison on the Washburn Trail which caused it to be closed. And everyone is marveling at the bear with 4 cubs on Swan Lake Flats. It seems that everyone I've talked to has seen a bear recently. Though I haven't seen a bear since last week I did manage to spot a bighorn sheep on the side of the road on Sylvan Pass on Sunday. On Saturday Patrick and I went to The Irma in Cody. The Irma is a hotel and restaurant that was once owned by Buffalo Bill Cody and named after his daughter. I had heard numerous good things about it and I finally got to eat there. And what was on the menu for us that evening?? Well, one of the delicacies of the West: Rocky Mountain Oysters. Yup, I just had to try them so I could say that I've had them. I even had seconds. It wasn't horrible, I just didn't really try to think too hard about what I was eating. It is definitely a 'done that' type situation that I don't plan on doing again. BTW, they don't taste anything like oysters!! Meet Ken, the man with the quick smile and the contagious laugh. He has a striking resemblance to Theodore Roosevelt. In his previous life (what many Yellowstone concessionaires refer to their life before Yellowstone) Ken was a steel worker in Pennsylvania and a shrimper in South Carolina. Now he is in the Adventure Store working the register and being the resident fishing expert. When any of us, or our guests, have fishing questions it is Ken we turn to. His talents don't just stop there, it turned out that he is a whiz with the Fountain and is a hot dog server extraordinaire. Unfortunately for us Ken will be leaving the Adventure Store in two weeks and heading to the YGS at Grant Village. Don't forget your family at Canyon, Ken! Bully for you! Rain, rain, go away. It continues with the gray, overcast skies with the occasional bouts of rain. We've decided that we need to have a Sun Dance (like the Snow Dance we did in Mammoth). Jack and David showed up today to start their Yellowstone summers. Dave, Ken, Jay and I went to the Nikon optics seminar and the fly fishing seminar. I had studied up on binoculars but it was nice to have a refresher on the topic. Admittedly, I didn't know much about fly fishing and I have just scratched the surface with the seminar. I'm fascinated by the names of the flies and I would love the chance to actually try casting a fly sometime. I do have visions of me whipping the line around and ending up in a tangled mess of fishing line that I'll have to cut my way out of. I took an evening drive and managed to see a fox by Tower Junction. But mostly I saw raindrops on my windshield. Andrea brings that good ol' southern charm to the Adventure Store. She spent the first 4 weeks working here as an Associate and now has taken her new position as Floor Supervisor. She left the relative spring comfort of Alabama to take up residence in snowy Wyoming for the summer and I am grateful that she was placed in the Adventure Store. With her new Merrel shoes she is ready to walk to the back storeroom to get a mug for a guest or to hit the trails (hopefully ones without bears, she says) with her co-workers. Andrea is always reliable and cheerful and eager to help whether it is to help a guest with the optics or to clean the bathrooms. Thanks Andrea, it's a pleasure to have you here! For your viewing pleasure I have included this shot of the World's Largest Holstein Cow in New Salem, North Dakota. After driving 887 miles in 14 1/2 hours I finally made it back to Canyon feeling a mild vibration from the large quantities of Mt. Dew that I consumed on my drive. I also feel that I am overly qualified to rate the cleanliness of every rest area between the Minnesota/North Dakota border and Livingston, MT. Sorry Montana but North Dakota has you beat on the best rest areas. And because of the numerous bug splats on my windshield I can also tell you that a gas station in Beach, ND has the best squeegees though I did find a gas station in Forsyth, MT that had a telescoping squeegee that I was mildly impressed with. Oh, the ways I try to amuse myself on this long drive. I missed working the Memorial Day weekend but it turned out to be even more busy than last year. And it continues to be very busy. On Monday night as I drove into Mammoth I was greeted with orange cones and rangers as they kept people away from the elk and bison on the grass across from the hotel. As I continued on to Canyon I was amazed at how many cars I was passing. I had assumed with the ending of the big weekend that the Park would somehow be much slower. But the crowds keep coming and every day seems to continue to get even busier. I think this year will even surpass last years record-breaking numbers. There has been some tragedies in the Park this past week. 2 climbers in the Canyon were killed when climbing ice. That had actually happened before I left but it wasn't until the story was printed in numerous newspapers that I learned the actually story. There has been another sad tragedy this week, also. 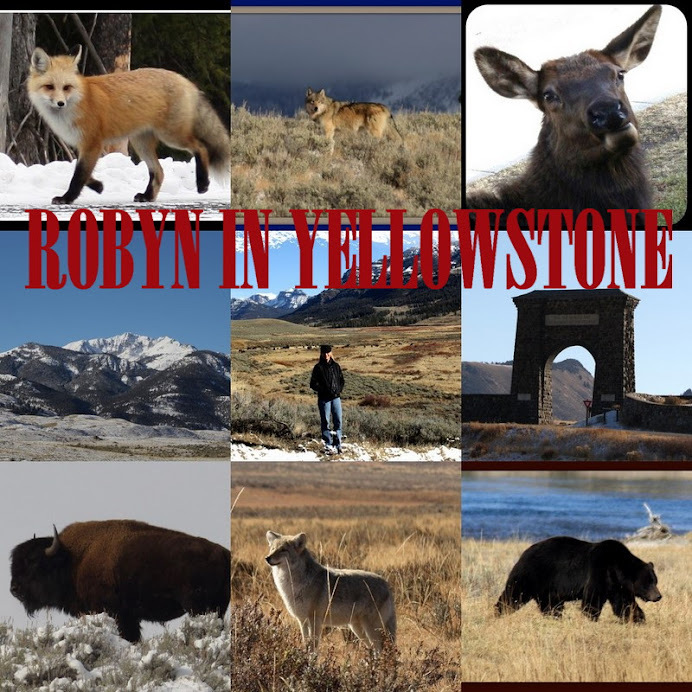 Yellowstone can be a dangerous place........and a place that some love and find peaceful. I will leave it at that. Also, 9 people were struck by lightening Tuesday at Old Faithful. The lightening here is an awesome sight. I have never seen so much sky to ground strikes anywhere. Recently I had been sitting outdoors with an overcast sky when suddenly there was a bright flash and an immediate crash of thunder. It had hit outside the big store and I immediately made my entrance into a building. This is the second time I have seen lightening hit the ground near the stores. Always be wary when the skies look threatening, and don't wait for the rain to start because lightening can strike at any time. I finally got to make my 'first of the year' drive over Dunraven this evening. It has been nearly 8 months since I have driven it. Before I even got there I did manage to find myself in a bison jam between Norris and Nymph Lake. It was great to finally see the bison babies up close. And I also saw 2 black bears between Floating Island and the road to Petrified Tree. There were numerous cars pulled over but I just drove by as there wasn't much room for me to pull over. Carl also mentioned that he watched the wolves invade a coyote den filled with pups in Hayden Valley last night. I wonder if it belonged to any of the coyotes that I saw there a few weeks ago. There have been numerous bear reports in the Canyon area as well as Fishing Bridge. And of course I should mention the bear with 4 cubs by Swan Lake Flats. Ken even saw a snake by Ice Lake as he was hiking. With my slight snake phobia I am glad it was Ken who got to experience this wildlife moment and not me. So far 2010 has been a great wildlife viewing year. And what can I say about the weather here? This week it has been snowy and rainy. And the outlook through the weekend doesn't show much improvement. It's not time to pack up the coats yet. Edgar has left the area but there is are new critters roaming the area in front of the store. Two resident chipmunks are entertaining the guests. Lee has nicknamed them Fred & Wilma and the make a regular showing throughout the day. I don't see anyone feeding them but I do see a lot of people taking out their cameras to get a shot of them. 29 new employees will be reporting to work at the big store tomorrow. 2 will be coming to the Adventure Store. We always have room in our family for more.